We value and salute those who serve our country. 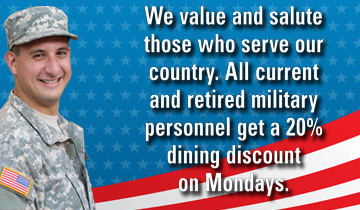 All current and retired military personnel get a 20% dining discount on Mondays. Dine in only. Must be a Gold Rewards member. Current or retired military ID must be shown to receive the discount.